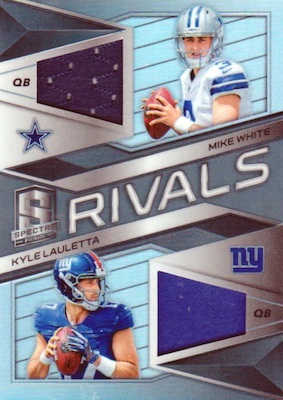 As bright and bold as it is expensive, 2018 Panini Spectra Football offers high-end elements and some vibrant designs for top stars and rookies in the NFL. Although the Hobby box output of four autographs and seven relics matches the 2017 release, the 2018 edition also features random "reverse boxes," which deliver seven autographs and four memorabilia cards. There are also new parallels and a larger amount of on-card autographs. Kept to 99 copies apiece, the 2018 Panini Spectra Football base set features retired players, veterans and rookies. 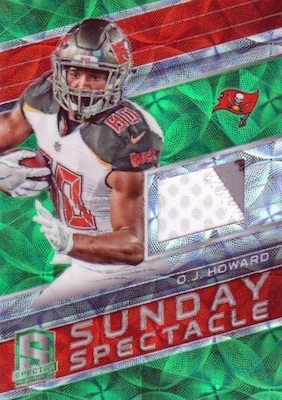 There are also various neon parallels with more limited die-cut versions. 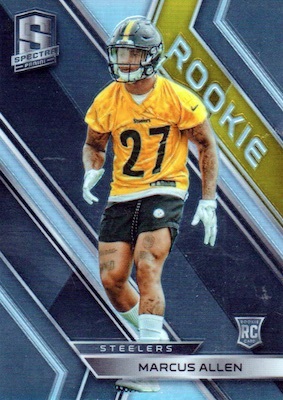 Getting right to the action, 2018 Panini Spectra Football caters heavily to the 2018 NFL Draft. 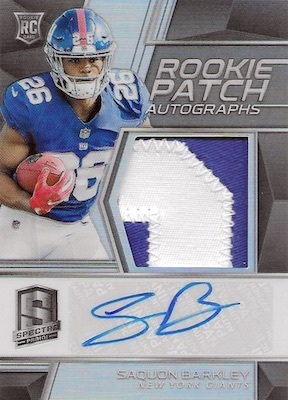 This includes Rookie Patch Autographs, Aspiring Patch Autographs and Radiant Rookie Autographs, each limited to 199 or less. 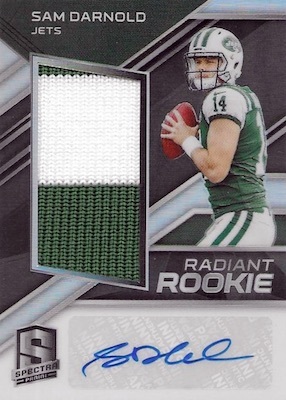 These cards also have an extensive run of flashy parallels, including Neon Blue (#/99 or less), Neon Green (#/75 or less), Neon Purple (#/50), Neon Pink (#/25), Neon Black Light (#/10), Neon Orange (#/5), Neon Marble (#/4), Nebula (#/2), Gold (1/1), Gold NFL Shield Tag (1/1), Gold Nike Swoosh Tag (1/1), Gold NFL Player’s Logo Tag (1/1). In addition, the Rookie Dual Patch Autograph (#/35 or less) cards feature signatures and relics for two first-year players. They add a full run of limited parallels, as well. 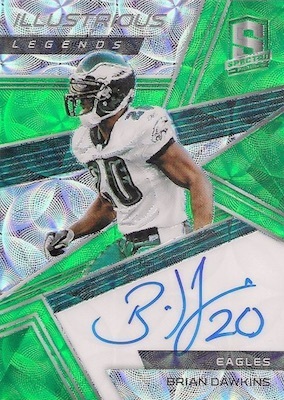 For the veteran and legend autographs in the 2018 Panini Spectra Football checklist, collectors can look forward to a good supply of on-card content. This includes Signatures, Illustrious Legends and Super Bowl Champion Signatures, each numbered to no more than 99 with multiple parallel tiers limited to 50 and less. 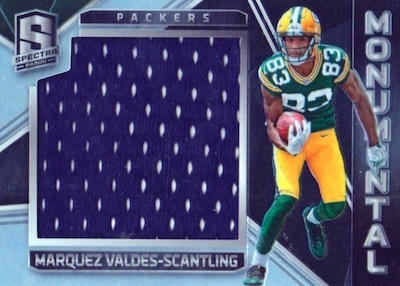 Averaging seven per box, 2018 Panini Spectra Football relics maintain the style and crazy colors across the rest of the product. Choices consist of Epic Legends, jumbo Monumental and triple-relic Building Blocks memorabilia inserts. All these lines are capped at 199 copies or less with multiple parallels to chase, such as the many neon versions, plus Nebula (#/2) and one-of-one Gold. 2018 Panini Spectra Rookie Patch Auto Neon Pink Sony MIchel 7 25!! SSP! DJ Moore 2018 Panini Spectra RPA Rookie Patch Auto Pink 25 3 Colors! 170 subjects. Serial numbered #/99. PARALLEL CARDS: Blue #/75, Blue Die-Cut #/35, Green #/30, Green Die-Cut #/25, Pink #/20, Pink Die-Cut #/15, Orange #/10, Orange Die-Cut #/5, Marble #/4, Nebula #/2, Gold 1/1. PARALLEL CARDS: Blue #/149, Green #/99, Pink #/50, Orange #/10, Marble #/4, Nebula #/2, Gold 1/1. PARALLEL CARDS: Blue #/75, Green #/60, Purple #/50 (Lamar Jackson #/25*), Pink #/25 (No Lamar Jackson*), Black Light #/10, Orange #/5, Marble #/4, Nebula #/2, Gold 1/1, Nike Swoosh 1/1, NFL Shield 1/1, NFLPA Logo 1/1. 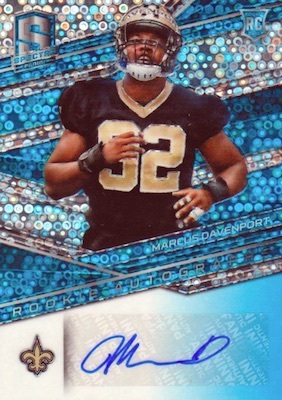 Shop 2018 Spectra NFL autographs on eBay. PARALLEL CARDS: Blue #/50 or less (list below), Green #/25 or less (list below), Pink #/15 or less, Orange #/5, Marble #/4, Nebula #/2, Gold 1/1. 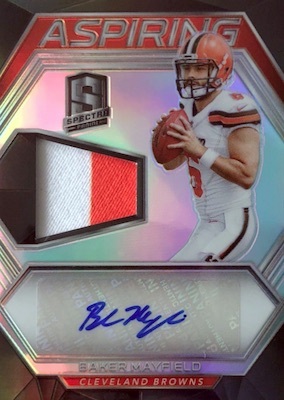 PARALLEL CARDS: Blue #/99 or less, Green #/50 or less, Purple #/35 or less, Pink #/15, Black Light #/10, Orange #/5, Marble #/4, Nebula #/2, Gold 1/1, Nike Swoosh 1/1, NFL Shield 1/1, NFLPA Logo Tag 1/1. PARALLEL CARDS: Pink #/15 or #/10, Orange #/5, Marble #/4, Nebula #/2, Gold 1/1. 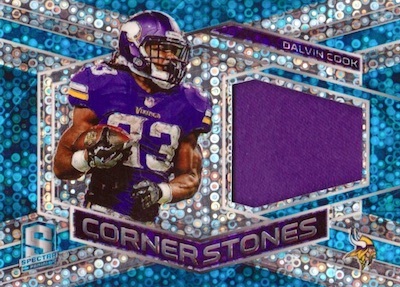 PARALLEL CARDS: Blue #/99 or less, Green #/50 or less, Purple #/35 or less, Pink #/15, Black Light #/10, Orange #/5, Marble #/4, Nebula #/2, Gold 1/1, Nike Swoosh 1/1, NFL Shield 1/1, NFLPA Logo 1/1. PARALLEL CARDS: Purple #/20, Pink #/15, Black Light #/10, Marble #/4, Nebula #/2, Gold 1/1, Nike Swoosh 1/1, NFL Shield 1/1, NFLPA Logo 1/1. PARALLEL CARDS: Orange #/5, Marble #/4, Nebula #/2, Gold 1/1. PARALLEL CARDS: Blue #/50, Green #/25, Pink #/15, Orange #/5, Marble #/4, Nebula #/2, Gold 1/1, Laundry Tags 1/1. PARALLEL CARDS: Blue #/99 or #/50, Green #/25 (Miler #/14*), Pink #/15, Orange #/5, Marble #/4, Nebula #/2, Gold 1/1. PARALLEL CARDS: Blue #/99 or #/50, Green #/25, Pink #/15, Orange #/5, Marble #/4, Nebula #/2, Gold 1/1, Laundry Tags 1/1. PARALLEL CARDS: Blue #/99 (Brady #/50*), Green #/25 (No Brady*), Pink #/15, Orange #/5, Marble #/4, Nebula #/2, Gold 1/1. PARALLEL CARDS: Blue #/99, Green #/50, Pink #/15, Orange #/5, Marble #/4, Nebula #/2, Gold 1/1, Nike Laundry Tag 1/1, Nike Logo 1/1, NFL Shield 1/1, Team Logo 1/1 *. PARALLEL CARDS: Blue #/99, Green #/25, Pink #/15, Orange #/5, Marble #/4, Nebula #/2, Gold 1/1. PARALLEL CARDS: Blue #/99, Green #/50, Pink #/15, Orange #/5, Marble #/4, Nebula #/2, Gold 1/1, Nike Swoosh 1/1, NFL Shield 1/1, NFLPA Logo 1/1. PARALLEL CARDS: Blue #/50, Green #/25, Pink #/15, Orange #/5, Marble #/4, Nebula #/2, Gold 1/1. PARALLEL CARDS: Blue #/99 (Miller,Peterson #/50*), Green #/25 (No Peterson*), Pink #/15 (No Peterson*), Orange #/5, Marble #/4, Nebula #/2, Gold 1/1, Laundry Tags 1/1. PARALLEL CARDS: Blue #/75, Green #/50, Pink #/15, Orange #/5, Marble #/4, Nebula #/2, Gold 1/1, Nike Swoosh1/1, NFL Shield 1/1 NFLPA Logo 1/1. 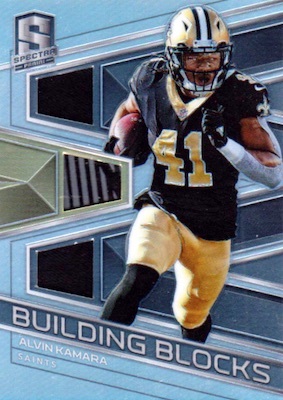 See the full 2018 Panini Spectra Football checklist spreadsheet. I’m excited about Spectra this year! It is one of my favorite sets and since a lot of the autos are on card this year (2017 didn’t have many online), I can’t wait to check it out. It will be pricey but if you can get into a break and hit, it will be worth it I feel. Excellent product but can we please get a checklist? We are now less than 24 hours away from the release. I would imagine that Panini knows the checklist at this point. This goes for all Panini products! 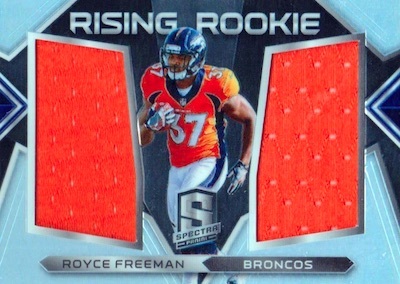 All I see are player worn patches – that have likely never been touched by any player. Another cost-cutting technique is the use of jerseys that don’t even have the player’s last name on them – evident by the usage of the nameplate patch “R” on “G-U-I-C-E”.